Overview - A gallery of high-living lowlifes will stop at nothing to get their sweaty hands on a jewel-encrusted falcon. Detective Sam Spade (Humphrey Bogart) wants to find out why – and who’ll take the fall for his partner’s murder. An all-star cast (including Sydney Greenstreet, Mary Astor, Peter Lorre and Elisha Cook Jr.) joins Bogart in this crackling mystery masterwork written for the screen (from Dashiell Hammett’s novel) and directed by John Huston. This 1941 Academy Awards® Nominee* catapulted Bogart to stardom and launched Huston’s directorial career - all with a bird and a bang. 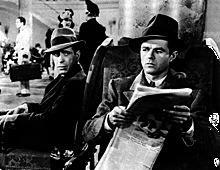 During the last moments of the film, San Francisco Police Detective Tom Polhaus (Ward Bond) asks private investigator Sam Spade (Humphrey Bogart) a literal question about what the Maltese Falcon is. Sam confuses him by offering a metaphor, paraphrasing William Shakespeare's "The Tempest" with the now-classic line "the stuff that dreams are made of." That quote also refers to the film itself, because 'The Maltese Falcon' is the stuff film lover's dream of. I don't know how the origin of the phrase "third time's the charm' originated, but it certainly fits here, providing one of the many exceptions to the rule to those who decry all Hollywood remakes. Warner Brothers adapted Dashiell Hammett's brilliant novel twice ('The Maltese Falcon' (1931) and 'Satan Met a Lady') before John Huston made his impressive directorial debut with it. 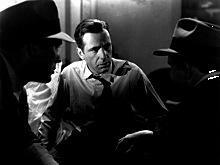 The picture was nominated for an Academy Award and Huston also received one for Best Adapted Screenplay (though legend has it his secretary typed up Hammett's book into a screenplay). Considered Hollywood's first film noir, 'The Maltese Falcon' opens with a brief bit of scrolling text about the history of this treasured object created in the 16th century before introducing Sam Spade and his partner Miles Archer who take on what appears to a simple case that involves tracking down a young woman who has left her family in New York to take up with a married man named Thursby. Archer agrees to tail Thursby that night, but ends up dead, shot by an unknown assailant. Spade is called to the crime scene, but doesn’t seem overly upset, and we soon learn the reason why. The police show up at Spade's apartment later in the night after Thursby is gunned down and consider Spade a suspect. The next morning, Spade goes meet with Brigid O'Shaughnessy (Mary Astor), the woman who hired them to tail Thursby. She's scared and explains the reason she wanted Thursby followed. Back at the office, Joel Cairo (Peter Lorre) visits Spade. He wants Spade's help in recovering the Maltese Falcon for which he will pay $5,000 and presumes that Spade has it or knows of its whereabouts. Finding this rather odd, he mentions Cairo to O'Shaughnessy when he sees her and she reveals knowing him. Spade sets up a meeting between the two that only results in revealing yet another person is after the Falcon, Kasper Gutman (Sydney Greenstreet in his screen debut which earned him an Academy Award nomination for Supporting Actor). As the film continues, the plot takes intelligent twists and turns as Spade tries to get to the bottom of what's going on. No one makes it easy for him. Not the cops, not the crooks, and not even Archer's widow. The real driving engine is the captivating characters brought to life by the very talented cast, and if you're a person who likes listening to people who like to talk, Hammett's dialogue will keep you enthralled. 'The Maltese Falcon' is a landmark film that cast a long shadow on the medium, and its greatness doesn't diminish with time or repeat viewings. 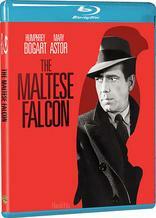 Warner Brothers brings 'The Maltese Falcon' to high-definition on a BD-50 Blu-ray disc housed inside a blue ecocase. The disc boots up directly to the menu screen without any promotional advertisements. The Blu-ray is also reported to be region-free. The video is given a 1080p/VC-1 transfer presented at an aspect ratio of 1.37:1, and fans of black and white cinematography are in for a treat as the image looks exquisite. The source is very clean with just some minor print damage in the scene where the cops come to Spade's apartment when O'Shaughnessy and Cairo are there. Some frames appear to be missing close to the end, causing Bogart's body to shift. There's lighter grain than I expected, although it increases in patches as light from the fireplace in Brigid's hotel room appear on the opposite wall. The gray scale exhibits great contrast. Blacks are inky and distinct when they're on different planes. There's very fine detail throughout, such as the pinstripes on Spade's suit, wood finishes on furniture, and the carvings of the Falcon. The shadow delineation is great as would be anticipated for a film noir that uses so much shadow. A good amount of depth is on display in the wide shots. Occasional softness appears on some objects within the frame. The mono soundtrack reveals its age with a slight hiss, but otherwise delivers a satisfying experience. The dialogue is clear and well balanced with the effects and the music. The gunshot that kills Miles sounds believable. Adolph Deutsch's score demonstrates the dynamics of the soundtrack as it plays softly underneath scenes and louder to help transitions. The music also engages the subwoofer by providing the most bass. Warner Night at the Movies (SD, 38 min) – This feature allows the viewer to recreate a night at the movie theater at the time of Falcon's release. There's a Sergeant York trailer, an excerpt from a British-made "News of the Day" with Roosevelt and Churchill meeting aboard a U.S. destroyer in the Atlantic, the musical short "A Gay Parisian" featuring ballet dancers, and two cartoons, "Hiawatha's Rabbit Hunt" starring Bugs and "Meet John Doughboy," a war-themed cartoon introduced by Porky Pig. When "All" is selected, it plays right into the film. It's very interesting with what is known about Roosevelt now to see him standing with assistance by holding onto a solider. Commentary Track - Bogart biographer Eric Lax is on hand. The Maltese Falcon: One Magnificent Bird (SD, 32 min) – A history of the story starts with a look at author Dashiell Hammett. Becoming Attractions: The Trailers of Humphrey Bogart (SD, 45 min) – A TCM special hosted by Robert Osborne examines how trailers were used to promote Bogart for the studio. Classic Hollywood fans will love it. Breakdowns of 1941 (SD, 12 min) – A collection of bloopers from the studio with effects and silly narration added. It's interesting to see actors from this time swearing, because it didn't happen in the films of the era. Makeup Test (SD, 1 min) – Mary Astor is shown in two different scenes, but it offers no value to viewer. Audio Vault – Three radio broadcasts are available: Lux Radio from 2/8/43 starring Edward G Robinson as Sam Spade (58 min); Screen Guild Theater from 9/20/43 (29 min) with Bogart, Astor, Greenstreet and Lorre; and Academy Award Theater from 7/3/46 (28 min) with Bogart, Astor, Greenstreet. It's fun to be able to go back in time and relive how people were entertained with these abbreviated adaptations. 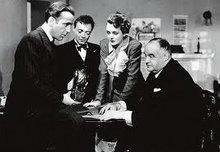 'The Maltese Falcon' is an all-time classic as valuable as the statuette itself. Warner Brothers does a great job presenting the film on Blu-ray with the limitations of the source. The film alone would make this a Highly Recommend Blu-ray, but the very fine presentation and extra features are icing on the cake. Get your hands on a copy but don't accept a fake.